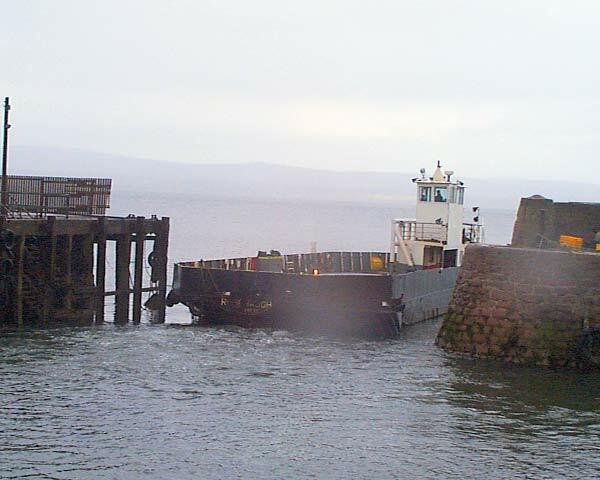 The Rosehaugh was the last Kessock ferry, superceded by the Kessock Bridge opened in 1982. Used here to transport cargo and personnel between rigs in the firth and Invergordon or Cromarty. The ramps for cars at the fore and aft port side have been removed but otherwise it looks much the same. When she was new she actually had 4 ramps, one at each corner. Yes, half of the accomodation was removed to allow for more cargo space and the wheelhouse has been extended. No, this is definately the Rosehaugh. The Eilan Dubh can be seen on picture #329. The angle of this picture foreshortens her a bit, and I think, looking at the picture on the other site that some of the passenger accommodation has also been removed. Was this not the Eileandubh? Wasn't the Rosehaugh the bigger ferry? If you look on www.undiscoveredscotland.co.uk/corran/corranferry isn't that one the Rosehaugh? I stand corrected. Also I think I need another pair of glasses!! It sad to see the Rosehaugh look as she is now. We all loved the Rosehaugh here at South Kessock - many happy memories.